Visiting Maligne Lake begins with a wild and dramatic journey along the 45-kilometre (28-mile) Maligne Lake Road—a worthy journey in itself and a wonderful introduction to Maligne Lake. Maligne Lake Road branches south from the Yellowhead Highway (Hwy. 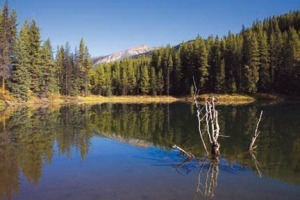 16) five km (three miles) east of downtown Jasper. After crossing the braided Athabasca River, it quickly reaches a turn-off leading right to Lakes Annette and Edith, as well as The Fairmont Jasper Park Lodge. At this junction, the road to Maligne Lake curves northward and passes through open montane meadows where elk are often seen grazing. The first worthwhile stop along Maligne Lake Road is Maligne Canyon, an awe-inspiring natural attraction created by thousands of years of water erosion. For more information, visit the Maligne Canyon page. Beyond Maligne Canyon, Maligne Lake Road closely follows the Maligne River for 16 kilometres (10 miles) to Medicine Lake. The Colin Range rises dramatically to the north, while the Maligne Range is across the river to the south. This is a good stretch of road for wildlife viewing, with deer, elk, and black bears commonly seen, especially in spring and fall. Medicine Lake in fall, when water levels are low. With dramatically fluctuating water levels and no visible outlet stream, six-kilometre-long (3.7-mile) Medicine Lake is the most intriguing feature along Maligne Lake Road. At the lake’s northwest corner, where Maligne Lake Road loops around the end of the lake, is a lookout with a sweeping view down the entire length of the lake. Interpretive panels tell the story of the natural history of the lake. From here, a steep path leads down to the lake itself. Each spring, the lake fills as the snow pack from surrounding mountains melts. By late summer, when runoff begins decreasing, the water level in the lake also begins dropping. By November, all that remains of the lake are mudflats and a few braided streams. Centuries ago, Métis, Stoney, and Cree that travelled through the Maligne Valley could not explain why the lake disappeared. They believed that the lake was inhabited by dark magic, or bad medicine, hence the name. The water, however, had not disappeared. It has just begun its underground travels through an extensive network of caves. 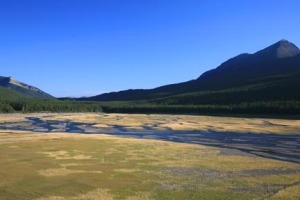 Judging from the large number of boulders clogging the valley immediately below Medicine Lake, it is apparent that the lake was at least partially formed by a massive rockslide that originated on the slopes of the Colin Range. 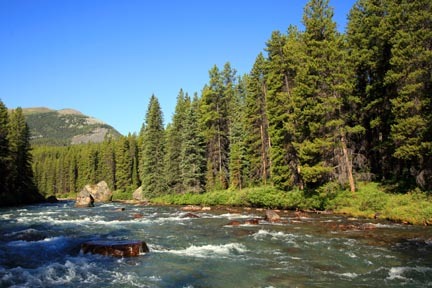 The trapped waters of the Maligne River eventually found passages downward into a cave system, so the water was able to escape via underground channels and resurface in the Maligne River further downstream. Today, water follows this same course. The best way to appreciate this phenomenon is to pull off Maligne Lake Road just before reaching Medicine Lake (travelling up-valley, look for the pullout on the right) and take note of the dry riverbed at the lake’s outlet. During the 1970s, geologists performed a number of experiments to better understand how Medicine Lake’s drainage system worked. Author Ben Gadd, writes of one such experiment in his book, Handbook of the Canadian Rockies. Red rhodamine, a dye that does not disperse in water, was introduced into the lake in order to determine how far the water travelled. The dye was found at various points in Maligne Canyon, but surprisingly, it also turned up in Lac Beauvert, which is not linked to the Maligne River by an aboveground waterway. This not only told experts that the water was travelling a great distance, it showed that this is one of the larger underground rivers in North America. Medicine Lake continues to be a source of geological wonder, largely because the underground caves and channels through which these waters run remain unexplored. At the southeast end of Medicine Lake is Beaver Creek Picnic Area, with picnic tables spread through a forested valley. A 1.6-kilometre (on-mile) trail leads from the rear of the picnic area to Beaver Lake, a shallow body of turquoise water where waterfowl such as loons are often seen. Allow one hour for the roundtrip. places, the road skirts close to the river, including at the Maligne River Picnic Area, with tables spread across a grassy riverside flat. Of geological note along this stretch of road are the massive boulders dotted through the forest. They were deposited here less than 14,000 years ago, after retreating glaciers at the end of the last ice age undercut layers of the Queen Elizabeth Ranges and caused a series of massive rockslides. After cresting a low rise and passing to tiny Rosemarie Lake, the road descends to Maligne Lake. The first turn-off to the left is parking for the Maligne Tours scenic cruise, the historic boathouse, the Mary Schäffer Loop, and a lakeside picnic area. Maligne Lake Road continues beyond this point for 500 metres (0.3 miles) over the Maligne River to another parking area, a boat launch, and the trailhead for hikes to Moose Lake, Lorraine and Mona Lakes, and the Bald Hills.